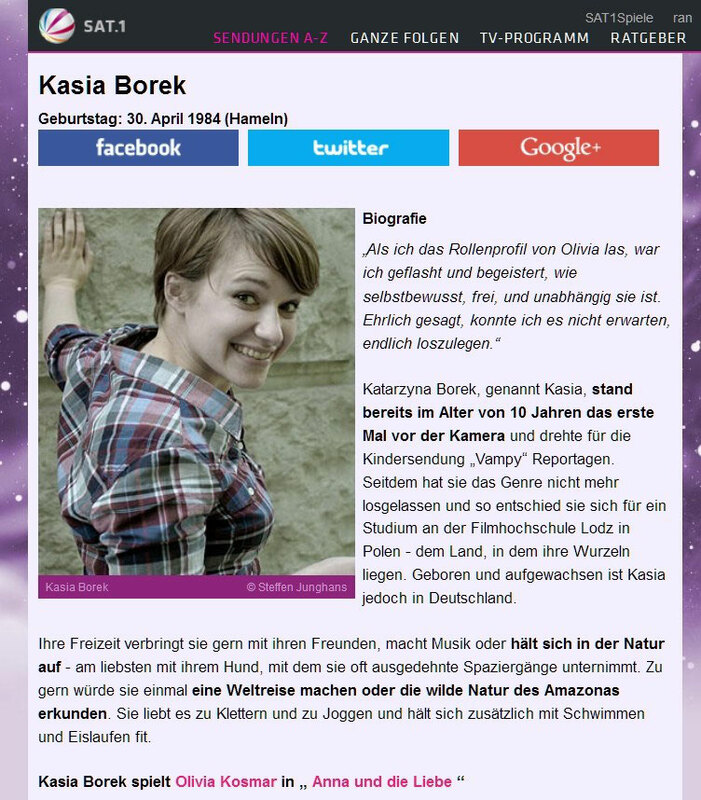 Interviews with Kasia about "Anna und die Liebe"
"I couldn't wait to get started!" 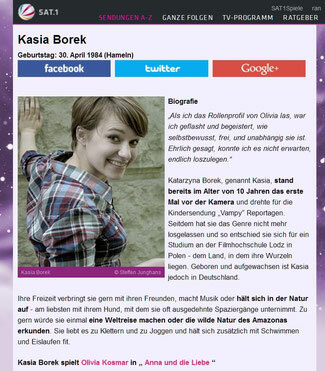 Kasia Borek about her new role, Olivia Kosmar. Good news for all "Jemma"- and Kasia Borek-fans: Kasia will be joining "Anna und die Liebe".You'll be able to see her there, beginning October 21st. She talked to us about her first days on the set and how she dealt with the end of "Hand aufs Herz". AudL: Which character are you going to play on AudL? KB: I am going to play the role of Olivia Kosmar, sister to Kai Kosmar- a freelance Photographer. AudL: Were alreday over the ending of "Hand aufs Herz" when you got the job with AudL? AudL: What has the work at "Hand aufs Herz" meant to you, and what kind of resumme would you draw after the long time you were on the show? KB: At Hand aufs Herz, I played my very first soap/serial character and I met great and lovely people.We were a wunderful team for a year and have fought together-that's not something one experiences every day, and that's why I am so grateful to have been able to experience such team spirit. AudL: Which kind of expectations do you hold for the new production and what do you look forward to the most? AudL: How did the first days of shooting go? KB: I was really insecure at the beginning, since the role I was about to play was completely different to the one I played on Hahe, but the directors and the acting coaches helped me a lot in forming Olivia, and now I'm ready for a new "risk". AudL: Do you think, that the Jemma fans will remain faithful, and will be watching AudL now? KB: I do hope,that they remain faithful, and I know, that they're already excited about how I am going to be embodying Olivia. It will be a different way of acting, but I am going to be striving for the same intensity. Look forward to it! "When I read the character profile of Olivia Kosmar, I was taken and thused by how self confident, free, and independent she is.To be honest, I could hardly wait to be getting started." Katarzyna Borek, called Kasia, was on camera the first time at the age of 10 and shot reportages for the children’s program „Vampy“. Since then the genre did not release her anymore and so she decided to study at the film academy Lodz in Poland – the country where her roots are. Yet Kasia is born and raised in Germany. She likes to spend her free time with her friends, makes music or spend her time in the open countryside – preferably with her dog, with which she often makes extended walks. She would love to go on a round-the- world-trip or discover the wild nature of the Amazon. She loves climbing and jogging and besides keeps herself fit with swimming and ice-skating. Christmas-fan or X-mas grouch: How the AudL actors spend the Christmas holidays, they disclose on the official Sat1-website in Decembre 2011. Here for you the English translation of Kasia’s answers. Christmas-Fan oder Weihnachtsmuffel: Wie die AudL-Schauspieler das Fest der Liebe verbringen, haben sie im Dezember 2011 auf der offiziellen Sat1-Website verraten. Hier nun für euch die englische Übersetzung von Kasias Antworten. Q: Are you a big Christmas Fan? A: Yes, definitely! I love it when the whole city is decorated with lights and Christmas decorations. Q: Where do you spend the Holidays? A: With my family, of course. Q: Do you buy presents for your loved ones? Or do you avoid the Christmas frenzy? A: A Christmas without gifts is like no Christmas for me, so each of my loved ones gets a least something small. Q: When do you start your gift buying? A: Every Year I try to collect gift ideas when someone casually mentions that they want this or that in a conversation but I cannot remember all of this myself, and so that’s why I get together with my sister about 4 weeks ahead of time because she always has the best ideas. Q: What is at the top of your wish list this year? A: Just comfort and sharing stories while drinking warm tea with my family all around me. Q: What would you never like to receive as a gift? A: I do not want any giant gifts, because then I always have to find a way to carry them home. ;-( Anything that can fit in my suitcase is great! Q: What are your favorite cookies, and do you like to bake? A: I bake a lot, and my favorites are vanilla cookies. Q: Do you decorate your home for the holidays? A: Yes, a little. At any rate, I have a lot of Yuletide candles all around my apartment. Q: Do you like to go to the Christmas Markets? A: Yes,actually I like christmas markets.. But I don’t like to go if they are overcrowded. Q: What does your holiday menu look like? Do you have a tradition? A: Yes, sure. My family celebrates with the Polish tradition. So we have Borscht as a starter and then fish. Q: Do you sing at home? A: Yes, but it is only my Mother and I that like to sing in my family. Mostly we are the ones to sing the Christmas Carols to their end. Q: Do you buy a Christmas tree, and if so, who decorates it? A: I do not buy one, but on Christmas Eve there is always one at my parent’s house that we decorate with candy canes, gingerbread cookies, and homemade garland and Christmas Balls. Q: Do you go to Church on Christmas Eve? A: As a child I had to go to the ceremony, but now I can choose for myself whether or not I wish to go. Q: Where and how do you spend the New Year? A: It varies, but always with friends. This year I will celebrate the New Year in Warsaw. Exactly: Also “Bodo” Frank Ziegler entered into “Anna und die Liebe”. What he has to tell us about Christmas, we translated likewise. Ihr seht richtig: Auch „Bodo“ Frank Ziegler ist bei „Anna und die Liebe“ eingestiegen. Was er über Weihnachten zu sagen hat, haben wir gleich mal mitübersetzt. A: I am a HUGE Christmas Fan!!! During Christmas is when I can spend the most time at home, so for me it is the best time of the year. A: At home with my family. A: I like to give them rather than receive, I find it totally magnificent! A: Starting in November I begin to keep my eyes and ears open, and I always try not to get my gifts too close to the day of, that would be horrible! A: I don‘t wish for anything for a long time. It’s funny, but I am probably just happy! A: When I have time I love to bake! I prefer hazelnut cookies, and cinnamon!! A: Sure! The tree is already standing on the balcony, and the apartment is decorated as well – I find that super!! A: We don’t really have any fixed traditions. This year my sister will cook, and I leave myself to be surprised. Q: If you look back, what was your most memorable Christmas? A: I have celebrated with my family for 24 years and each one has been memorable! A: As children we used to sing before all of the presents were given out, while playing the guitar or the flute. Today we do not torment our parents anymore! A: When I get to my family home I will buy a tree, probably around the 22nd or the 23rd, and then we’ll decorate it. A: I am not sure yet. I’m more of a quiet New Year’s Eve-type, I usually avoid the big parties.